Our next patch will be at 12:00 am PST on December 14th! Remember to keep an eye out for the in-game message for when the servers will be closed for update! In upcoming builds, we plan to continue to buff defense facilities such as the Spell Tower, to give the defending players/houses more advantage over the attacking party in combat. Adjusted Elemental Tower attack to beam/ray attack. Once the Spell Tower aims at its target, its attack will 100% hit it. This will greatly increase the hit percentage and strengthen the defensive ability for Elemental Tower. This will prevent players from being able to unfairly dodge it. We will also reduce the crafting cost for Spell Tower Ammo. For the same amount of crafting cost, you will be able to produce triple the amount of ammo after this patch. Gorgon’s artifact bow will be nerfed by disabling its ability to range-attack Spell Tower while the character is outside Spell Tower’s attack range. Iron structures and Manor structures will no longer take damage from Gorgon’s artifact bow. Only against, straw, wooden and stone structures. We’ve adjusted how you control tamed Giant Bufo’s swallowing ability. After you press MMB (Middle mouse button) to swallow the target, within a certain period, you can press MMB again to disgorge it. Swallowed targets with lighter weight will travel longer distance when disgorged from Bufo. This creates more possibility for Giant Bufo to combo with other tames. 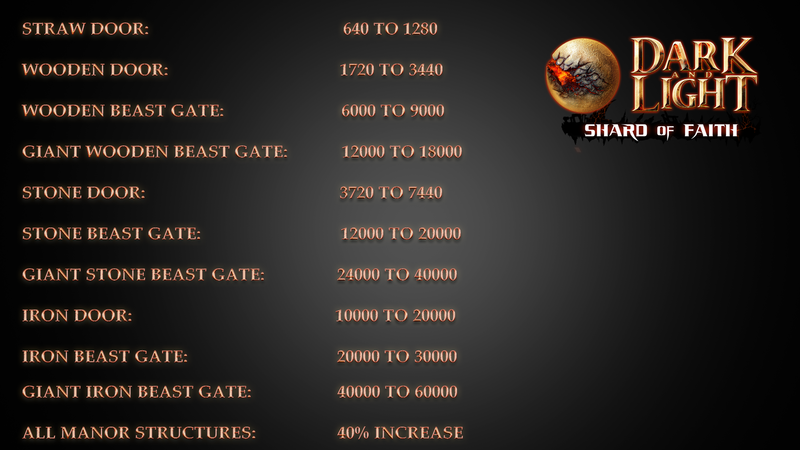 Via Soul Node, players from any one of the above servers (whether it being The Sacred Path server or Shard of Faith server) can transfer their characters to any one of the above servers (whether it being The Sacred Path server or Shard of Faith server) while keeping their character levels, and Knowledge progression, and Quest progression. You can also bring items with your character in your inventory (with the exception of Summoning Stone, Small Soul Suppression Stone, Soul Suppression Stone, and Shipyard, etc) However, while item transferability is available, we currently advise against transferring items as you might encounter item loss. We’ve done our tests with transferring items, and will continue to test to make sure item transfer is implemented as designed without bugs. Spanish Localization - Spanish localization will be implemented in this patch. Other Fixes Fix an issue where Treant is not correctly catalyzing plant growth in crop plots.